This report was been copied from Williams Today. I arrived at WSC Sunday 4/3/2016 at about 11:15 PDT for a flight in a WSC ASW 24, I was greeted by Kempton who announced that I was late for a flight with him in FNX! I readily agreed to a flight with him after clearing with Noelle. Good things happen to those go to the airport! FNX is an ASH 25-25 meters with best glide of 60:1. 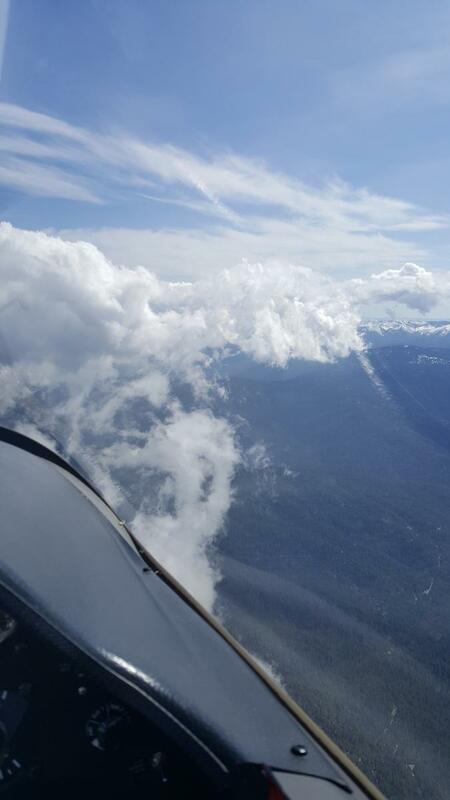 We launched at 11:45PDT on a tow to Walker Ridge, and I was briefed by Kempton on the tow to look for a climb at Walker then head north if possible. If not we head south. Kempton released at 4500msl…. Yikes! This was below the altitude that I have decided I must head for WSC in an ASW 24 to be sure to make it back at 2000 AGL over WSC. The glide angle of FNX is clearly much better than an ASW 24. Here is the SeeYou “Route” view with the RASP forecast for 1200PST (1300PDT) Surface Wind Convergence overlaid. Notice that our route north closely follows the convergence. The first photograph is over the ridge east of Tree Farm at about 5000 MSL looking north at St. John with Snow to the left. Notice that the bases of CU west of the convergence are higher. We flew along the west side of the convergence most of the day. Here is a photograph that illustrates our proximity to the terrain on the way to Snow. We were about 300 AGL on this ridge above Letts lake. Most of the flight from Snow to Yolla Pk was around 500-1000AGL above the ridges. CU bases about 8K west of the convergence and about 6K east of the convergence and sometimes right on the ground to the east. We were able to climb somewhat higher than the bases by keeping close to the clouds on the west side. The next photograph is typical of the clouds on the flight north. The next photograph shows Yolla Peak from about 9000msl. We are still not fat on altitude, but due to the very flat glide we were always within gliding distance of a good airport. We proceed north toward T15, but turned around a few miles short, at our high point of the day 10,300 msl, due to clouds all around it. About half way between T15 and Anthony Peak south bound at about 8.5K I was allowed some time on the controls to demonstrate some of my learning to date. I was able to keep us out of the rocks and even climb a bit to a point abeam Sheet Iron Mtn. where I relinquished the controls to take more photographs. We joined Pete-98 flying his ASG29 around Tree Farm. Plan to have an airport within gliding distance. Plan the next 3 sources of lift. To find lift look for wispies, dangly bits and dark underside of CU. Look for lift on the windward and sunny side of CU. Press on with evidence of lift ahead and safe altitude. This was a practical exercise demonstrated by Kempton on the many technics offered on the Cross Country and Thermaling thread posted on the Williams forum by many of the experienced pilots who fly from Williams and one from central California. I won’t list names for fear of missing someone, you know who you are. I thank you all. Thanks does not quite cover my appreciation for the opportunity to join Kempton on two flights so far in his wonderful FNX. I just discovered on OLC that Peter Deane “2T” launched 52 Min. after FNX at 12:37PDT and flew about the same route north getting somewhat closer to T15 before returning to WSC. Find both log files on OLC. 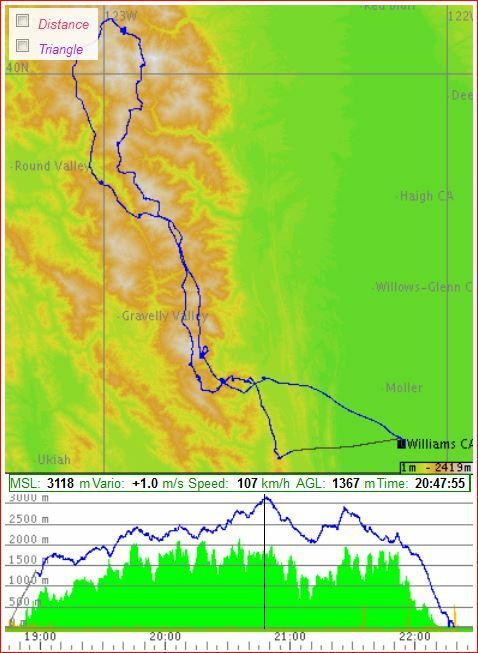 As the day was percolating nicely by the time we launched (Walker had several cu on it), it was an easy decision to release and glide into Walker to get going. Like the previous two days, the shear was working nicely, but not as pronounced. Nevertheless, it was a perfect setup to give Russ practice in reading and working the shear clouds. Yes it was a little easier later as the convergence had developed a little better, though still quite low by normal standards. I was able to push low to the convergence zone between Snow And Sheet Iron without plunging over the edge to the west side of Snow. Never really broke 8300 until Yolla Pk. The line of my flight tracked the convergence line you marked on your first picture almost exactly. On the way back south I was a little higher and could relax enough to take a few snaps. Cloudsurfing like this is truly a real treat. Snow Mt in the distance. Cloudsurfing is a new term for me, but describes perfectly what we were doing most of the day Sunday! That sounds like a much more fun flight than my first flight on Saturday 4/2. The day started slow, but looked really good on the RASP. The good news was that the RASP was right and 1400 was the start of the solid conditions. The bad news was that I launched at 1300 shortly after the first glass ship returned for a relight. We had 8 ships waiting to launch so I took as early of a tow as I could. Released at 1400agl into OK lift. Spent the next 45 minutes or so grinding around between 900 and 1500 AGL before it started to improve and I could get into the foothills where I found our first decent climb. It ended up taking over an hour to get to about 5000 and connect with the convergence. About 1:10 into the flight, my copilot’s buddy Ralph decided to show up. This was despite me letting him fly once we got out of the tumbleweeds in the valley. He thought he was going to be OK after that. I turned on the O2 despite only being at 6000. We then only ended up needing about 3 more thermals to connect with clouds about 15 miles south of Avenal. From there it was a strong convergence line at 8-9k and didn’t require turning. About 1:50 into the flight, Ralph came back on board. We were 40 miles out, beautiful flat bottom cu headed away from us for another 60 miles along the convergence. It was cruel to continue and cruel to turn back. I decided to turn back and be cruel to myself rather than scar the poor student. Raced back to Avenal at 80-90kts. Called in to coordinate a backup candidate and hoping I could get back in the air quick with another student. It was well over an hour before we launched. Somewhere right around 5pm. The convergence had moved closer at least, so we had a pretty easy time getting up from a low tow and then connecting with the clouds. Ran about the same distance south but kept Avenal in glide since it was nearly 6pm. The way back was a milk run. I let the student fly most of the flight since the opportunity to really go anywhere was lost. Just helped coach him on choosing where to slow and when to speed up. Eventually worked on some thermal selection and centering. It wasn’t required, but good experience. In the end both students had a lot of fun, even the one that got sick. They learned a bunch and got a chance to see that soaring is not just taking the 2-33 up to 2000 feet and winding down in a slow death. They all just started late fall this year and have mostly only see sled ride conditions. Congrats on a beautiful flight and not getting airsick, that’s no fun for anyone.